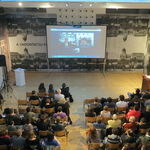 Over 120 guests gathered at OSA on April 9 for the first Hungarian preview of Laura Poitra's Oscar-winning documentary, CitizenFour. Co-hosted with the Center for Media, Data and Society at CEU, and with a professional audience of journalists, lawyers, civil society activists, academics and students, we began the evening with a half-hour live discussion over Skype with Anthony Romero, (Executive Director of the American Civil Liberties Union, and Edward Snowden's lawyer in the US) and Gill Phillips (Director of Editorial Legal Services, The Guardian). Our guest speakers spoke about their respective legal roles and personal involvement in the Snowden case, the generation gap in reactions to the revelations, and the rise of the new global movement on freedom of information and informational privacy rights: a new chapter in the history of human and civil rights activism, and one that will shape the future of politics for citizens and internet users of all states. The discussion also covered whistle-blowing and its risks, the danger of self-censorship, and the everyday realities of contemporary surveillance. About the film: In January 2013, film maker Laura Poitras received encrypted emails from a stranger who called himself Citizen Four, and who claimed to have evidence on illegal wiretapping practices by the US National Security Agency and other intelligence services. Five months later, two Guardian reporters, Glenn Greenwald and Ewan MacAskill flew to Hong Kong to meet the informer, who identified himself as Edward Snowden. Live in front of the camera, one of the greatest recent scandals of modern times unfolded, and these recordings form the basis of the film. CitizenFour will screen in Hungary at the Titanic film festival before its general release in late April.